Blurb: The nation of Garnia has been at war for as long as Auxiliary Lieutenant Josette Dupre can remember – this time against neighboring Vinzhalia. Garnia’s Air Signal Corp stands out as the favored martial child of the King. But though it’s co-ed, women on-board are only allowed “auxiliary” crew positions and are banned from combat. In extenuating circumstances, Josette saves her airship in the heat of battle. She is rewarded with the Mistral, becoming Garnia’s first female captain. So, I’m actually pissed at myself for this one, because I think I messed up my own experience with it. This book intrigued me. I didn’t know too much about it, just sorta stumbled upon it on Twitter one day, but I was intrigued enough to add it to the list of books I wanted for Christmas and was lucky enough to get it. And I actually read it pretty soon after I got it, unlike a lot of other books on my To-Read list this year, which I’ve owned for years a while and haven’t gotten around to, yet. Yet as I was changing the status on Goodreads, I noticed some of the reviews at the bottom. And they weren’t all exactly positive. Usually, I don’t even look at reviews, let alone let my opinion be based off of them–especially because every book will have a range of reviews, naturally (which I know is ironic, because I write reviews myself and you’re probably asking, Well then, what’s the point of these reviews?, to which I’d respond in kind: I usually don’t read many books I don’t like ((not sure how that happens, but look at my reviews and you’ll see I just fall in love with the books I read, ninety percent of the time)) so my reviews, personally, are for two purposes: one, to gush about a book I just loved yet have no one else to rant talk about it with and two, help the author out a little bit, even if I have a pretty small audience here. I like to read reviews of books I’ve already read, in hopes of finding someone else to gush with. I usually don’t read them to ascertain if a book is my fancy or not. I’m weird, I know). But, I caught myself reading some of these reviews and getting discouraged. For one reason or another, I just assumed this book was going to be awesome. It was a military fantasy with steampunk influences about a woman trying to make her place in a world where women are undervalued. How could it not be awesome? Yet I think those reviews did taint my reading, because while I did enjoy the book, I didn’t like it as much as I imagined I would. Don’t get me wrong: it’s a good book. The details were great, I could easily picture what was going on and I loved the battle-focus, even if I felt some of the battle scenes went on a bit longer than necessary. I think I had two main hang ups, that kept me from absolutely falling in love. First, I was really irked by the treatment of women in the story. I get that is part of the culture and the world, but it was just…really hard to read about a world where women were looked at in such low regard in many ways. I don’t think that can really count against the book, but it did influence my opinion of it, so…take that as you will. Second, I would have liked to get to know Josette and Lord Bernat a little bit better. They were both very interesting characters and they contrasted wonderfully, but I didn’t always feel like I understood where they were coming from/their motivations and I wanted to be inside their heads a little bit more. 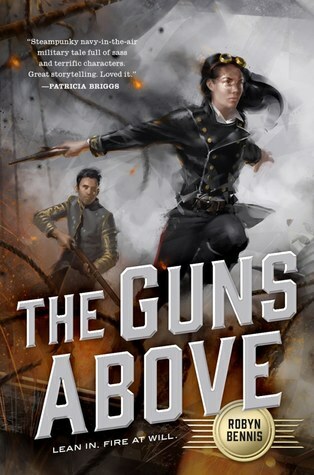 That said, it was still a good read and I’m looking forward to continuing the series (By Fires Above comes out this May). And this time, I’ll avoid looking at any reviews (regardless of whether they actually tainted my reading or if I would have had that opinion anyway).